Sometimes, you see a technology that is extremely cool and can’t wait for it to hit the market. And sometimes, you see something like Headphone:X from DTS that feels more like a pipe-dream that leads you to imagine where it might make the most sense. Could this X-Factor ever really be heard by more than a select few? Which got me thinking that DTS and Headphone:X is a prime technology candidate for marketing and experiential sampling. 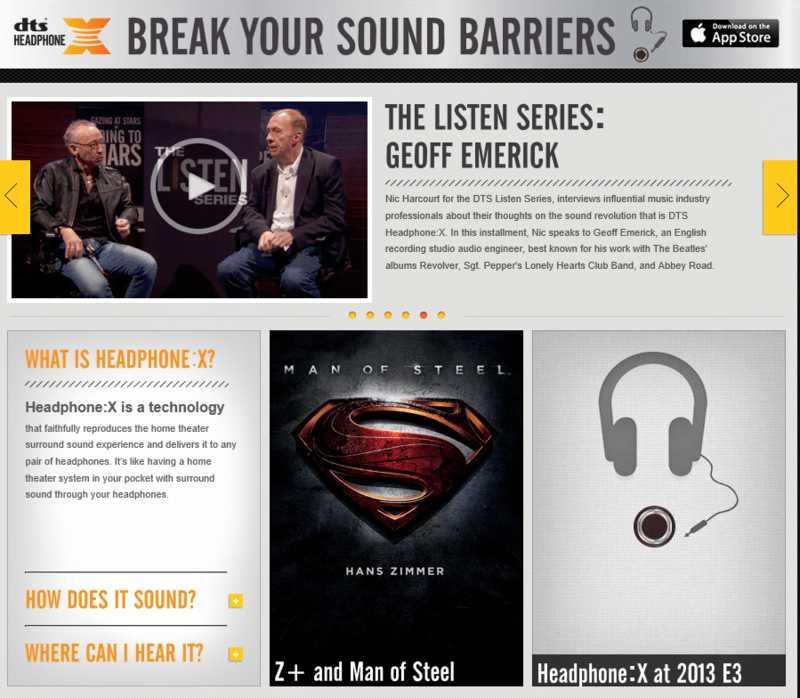 We first experienced Headphone:X at CES 2013 and blogged about it in the recap. They put people in a room with 11 speakers placed about and did a white noise cycle. Then they asked everyone to put their headphones on and seemingly repeated except they did not use the speakers, all the directionality was via the headsets alone. They then went on to showcase a bunch more music and sound effects and challenged you to take the headphones off to kill your disbelief. – Was a new receiver required or was it backwards compatible with existing DTS receivers. To me, its an incredible sounding gimmick that might never really find real momentum, just like 7.1 is hard to come by because very few elements are engineered for it, nor do most consumers have the required 7 speakers in their music room. Headphone:X is a great solution as you can use most any set of headsets, but that processing and source engineering poses some release challenges. Now, if we’re talking about experiential environments that can truly transport someone through audio alone, there’s a huge opportunity – but you’ve got to find the client or content creator with a need and wherewithal for such a thing. Creating that environment that truly tickles the senses in a way people aren’t accustomed to is much stronger than just re-purposing video or an experience the consumer could easily have elsewhere. With the right utilization, Headphone:X could be the X-Factor that differentiates your message being heard rather than ignored.